Clun is a small ‘Walkers Are Welcome’ town on the border of Wales in the undulating Shropshire Hills, just 15 minutes from us in Chapel Lawn. 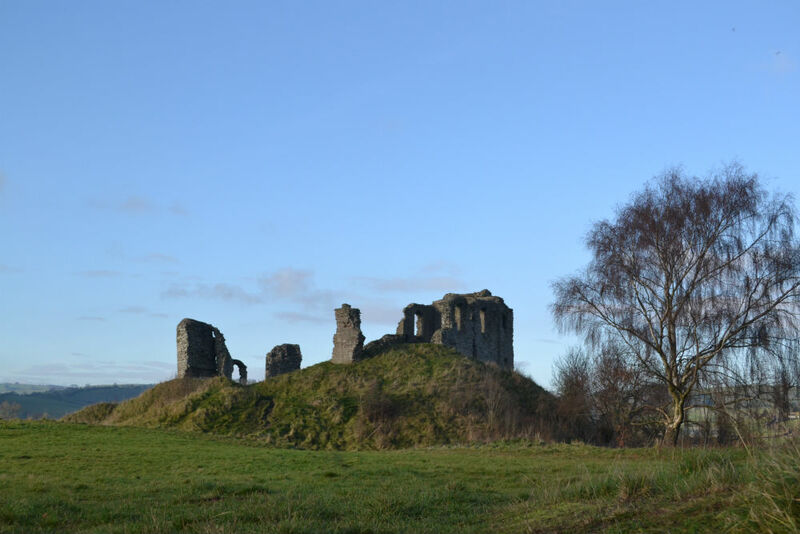 There has been a castle or fort in Clun since the 11th Century. The ruins that can be seen today were built in the 13th Century. Nowadays Clun is a lively network of twisting streets with friendly people in the small independent shops and tea rooms. 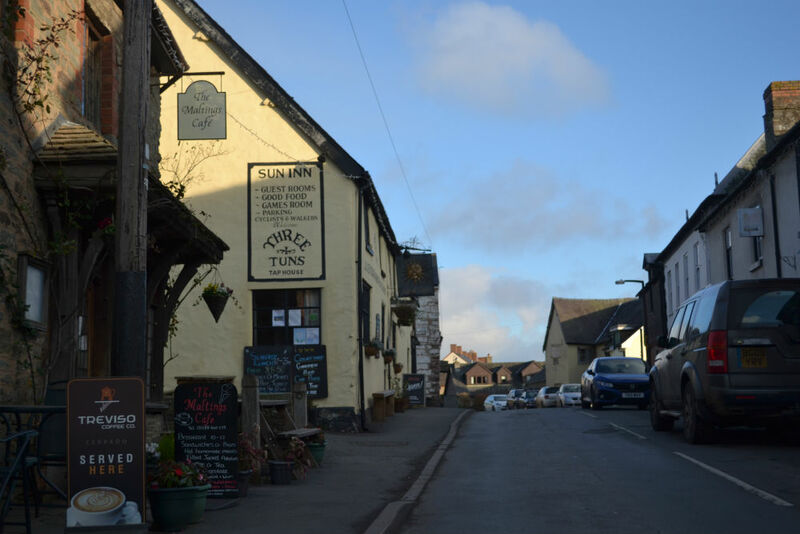 The White Horse Inn has its own brewery, The Clun Brewery, from where three regular ales and some specials are distributed to other pubs in the surrounding area. 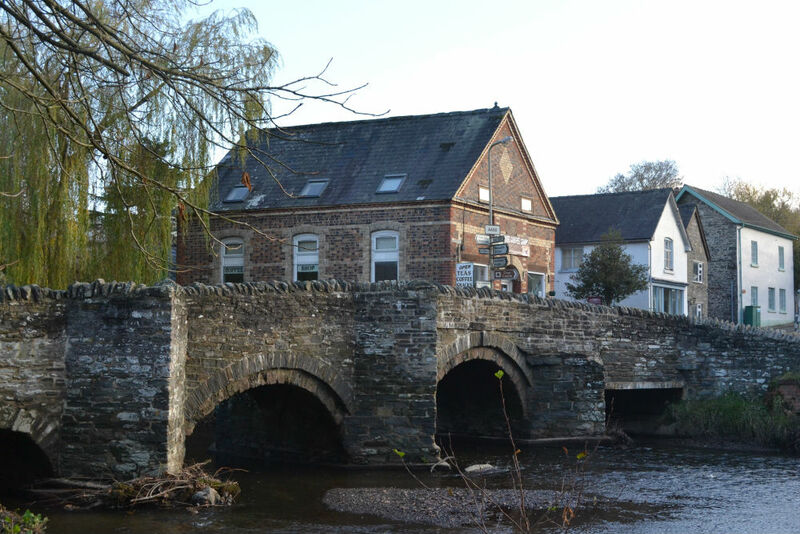 The 14th century packhorse bridge crossing the River Clun is in the centre of the town. This is the oldest packhorse bridge in Shropshire. A packhorse bridge is a narrow bridge built before 1800 with low parapets which would not interfere with a packhorse’s paniers. The car park next to the River Clun at the bottom of town is an ideal place from which to explore the town. There is also another car park at the Memorial Hall and Playing Fields towards Guilden Down. If you enjoy walks that will get you away from the crowds, then this is the place for you. As A.E. Houseman wrote in ‘A Shropshire Lad’, "Clunton and Clunbury, Clungunford and Clun are the quietest places under the sun." 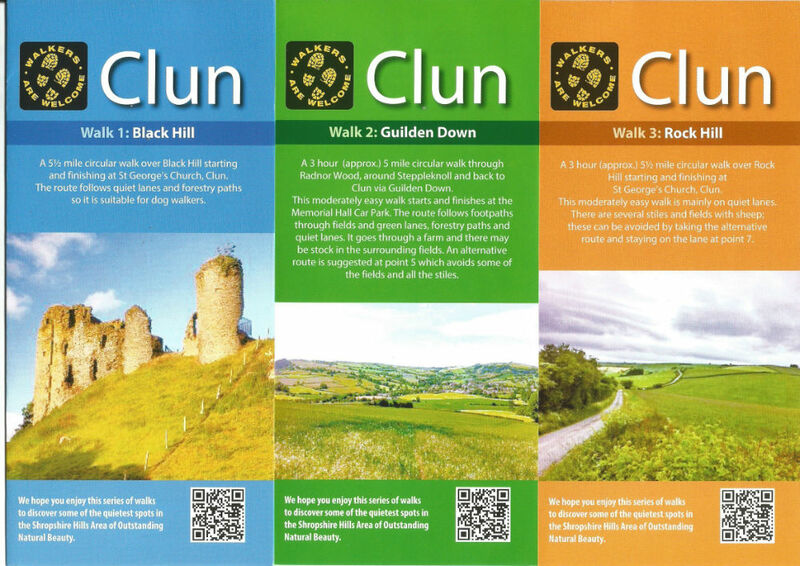 Clun Walkers Are Welcome produce a series of three leaflets with great walks starting from Clun. The leaflets are available from The School House B&B, Caractacus Gift Shop, The Tourist Information centre and outlets in the town or online here, here and here. This is a 5 ½ mile walk which heads south from the town and goes up to the Forestry Commission plantations of Black Hill. It offers views of Clun Castle as well as the Iron Age forts on the top of Caer Caradoc at Chapel Lawn and Bury Ditches at Guilden Down. A 3 hour (5 mile) walk which goes across Guilden Down to the Bury Ditches Hillfort before returning back to Clun. This walk has the advantage of having ‘Tea on The Way’ close to the end of the route where you can get yummy tea & cakes. They also sell many different types of jam and preserves from the honesty stall outside the house. Another walk of about 3 hours (5 ½ miles) which is moderately easy as it has some sections on the quiet level lanes and offers great views of the Clun Valley. This one starts and finishes next to the Bridge Coffee Shop.